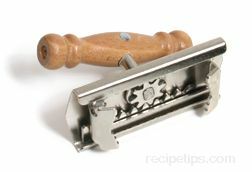 A kitchen utensil for use in removing or tightening glass jar lids. Some Jar Openers are designed as cushioned tongs that are curved to fit evenly around each side of a jar opening. Pressure on the handles closes the tongs so the lid can be turned tightly to close it or to maintain leverage to open the lid and/or pry it off the mouth of the jar. Covering the metal body of the stainless steel opener, the padding on the handles and tongs also helps to stabilize the pressure, thus reducing breakage that may occur with glass containers. In addition to tong openers, other types of Jar Openers may include silicon sleeves that fit over the jar lid, providing a non-slip material so the lid can be grasped for opening or closing. 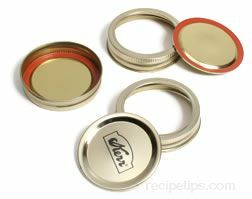 Toothed Lid Openers, which consist of two metal rails positioned in a "V" shape that allows a lid to be positioned into the V snuggly so the teeth grasp the lid and allow it to be held tightly while the jar is turned so the lid is opened. Another type of Jar Opener is made like a geared clamp that opens and closes as the turnbar, which controls the clamp, is moved back or forward in a circular motion. Moving it back opens the clamp so the jar can be inserted between the clamps and then it is closed around the lid to tighten the grasp as the jar is turned to open the top.